I’ve been a full-time homemaker for almost 15 years. 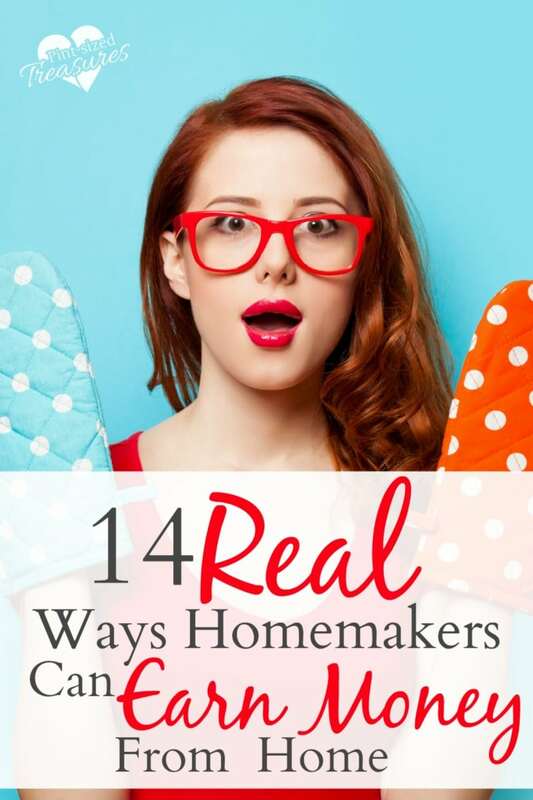 During these years of homemaking I have found creative, real ways to earn money from home. Why? Because I enjoy being staying at home full-time so I am always there my when family needs me. I don’t have to re-schedule outside commitments to help my husband in an emergency. When my kids are sick, many times I am able take most of the day cuddling them and bringing them special snacks and treats. The laundry can wait until tomorrow. I think the choice of staying home full-time has blessed our family in more ways than we can count, but we have had to make financial sacrifices to ensure our family could indeed live on one income. But, then special situations would come up and it would be very handy if I had some extra cash saved from some opportunities that I found to make money from home. Some have been small, and some have been substantial. And today, I am spilling it all. I am giving all the details of what I do and also what has worked for other homemakers like you. It’s important that homemakers have the option of earning money. It gives us the freedom and flexibility to treat our families or take financial pressure off of our husbands. It also helps us prepare a more business-like mind that may be needed if our we are left alone without someone to provide for us. It keeps us in touch with the business management side of living so if we become the sole provider for our family one day, it’s not a complete head-spinning experience. Does that ever cross your mind? I have to admit that it does mine. When I look at my children, I desire to provide them the happiest home in the entire world. Yes, money does not bring happiness, but it takes money to live, eat and become educated. My kids look to my husband and I to provide for them and I don’t want to be wringing my hands without a way to provide for them if one day I do become the sole provider. I want my kids to know that their parents are willing to work hard and sacrifice material possessions and leisure time in order to provide for them. 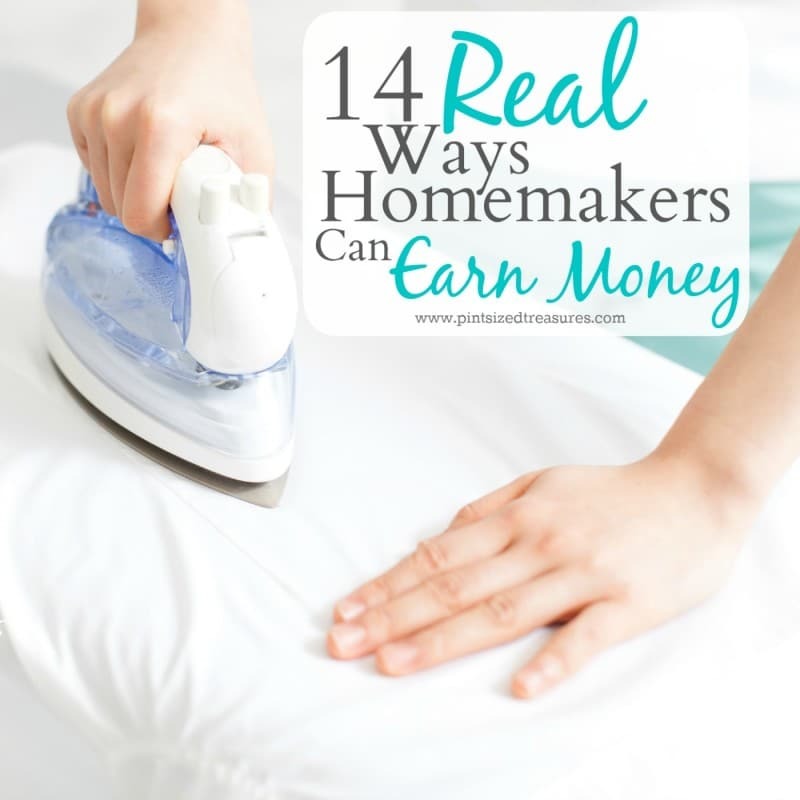 Did you know there are other homemakers out there who are working from home to earn money for their families? I have some good friends who are earning well-paid, full-time incomes straight form the comfort of their homes. So yes, you can have your cake and eat it too! Smart WAHM course that helps you uncover your talents and abilities and teaches you exactly how to turn that into a dependable income! The course comes with 22 lessons with actionable tasks and printables to keep you motivated, on track and on the road to a successful work at home mom career. You also get exclusive access to a private Facebook group where other moms share the best of the best WAHM tips! Want three free lessons to wet your appetite? Sign up here! Look around your home. When things got super-tight financially at our house I would look around and find objects I didn’t necessarily need, but would sell at a reasonable price. Home decor, baby equipment, gently used clothing — anything that you don’t absolutely love or need can be considered perfect for selling. You can sell on Facebook, Craigslist or reach out to a resell or consignment store near you. Listia is also a great place to sell, and if you sign up here, you’ll get an extra 1,000 credits to get you started! During the summer, yard sales do quite well in certain areas of the country. And don’t forget the huge consignment sales at your local expo center! Learn to coupon efficiently. One of the gurus of effective couponing is Crystal Paine from Money-saving Mom. Her Grocery University course in available in the bundle above where she talks about learning the ins and outs of couponing. You can start by checking out this huge resource of coupons. There’s also a Etsy or Teachers Pay Teachers. This printable brought in a good bit of income for me last month. Much more than baby-sitting ever did! Offer to clean homes. Having a trusted friend come in and clean your home is a stress reliever. Many busy parents would love this opportunity, and would probably love having the chance to invest in helping out another friend financially. If you do go this route, make sure you give it your best. Learn all the best cleaning tips before working on someone else’s house, and always be professional about it — on time, efficient and dependable. Become a virtual assistant. I have been offered this job a few times, but never took it. However, I have chatted with several moms who made part-time and full-time incomes being a virtual assistant. You can sign up with companies like Elance. It’s a reputable company and can connect you with a company or individual who will be interested in your skills. Some jobs include handling email lists, writing content, editing photos, answering phone calls and the list goes on. It’s definitely something to look in if you are needing more stable income as many companies hire full-time virtual assistants — and most income-earning bloggers have at least one! What are your best money-making tips for homemakers? Share them with us on social media!